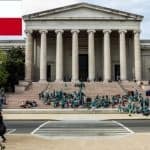 Germany is a Schengen country full of history, modern cities, picturesque towns, and some of the most spectacular forest and lake regions in Europe. Munich and Berlin are great for shopping and enjoying the local cuisine, spending time wandering around local art galleries and dancing the night away. 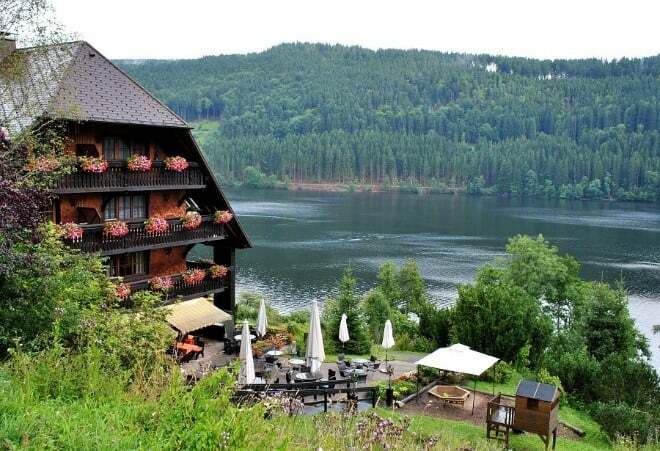 There’s also Dresden and Bremen which are perfect for delving into the past or nature lovers will be in awe of the Black Forest and the rugged Baltic coastline. Whatever you plan to do in Germany, you can be sure there is something to suit everyone’s tastes. 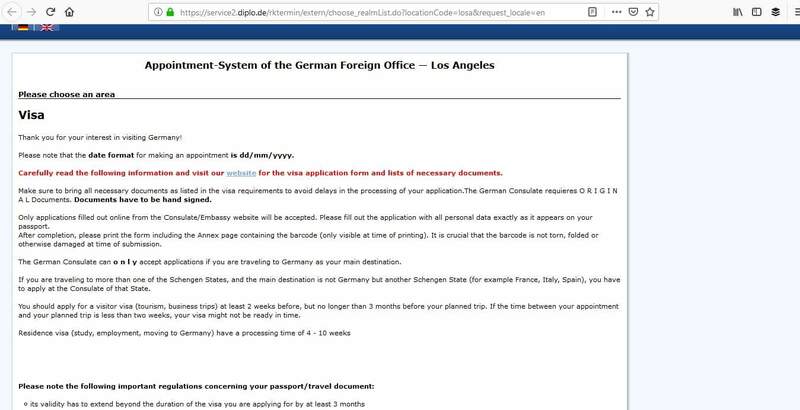 In this article learn more about how to apply for Germany Visa at the German consulate in Los Angeles, California, German visa appointment booking, Processing time at the German visa application center and Germany Visa Application Process at the Los Angeles consulate. 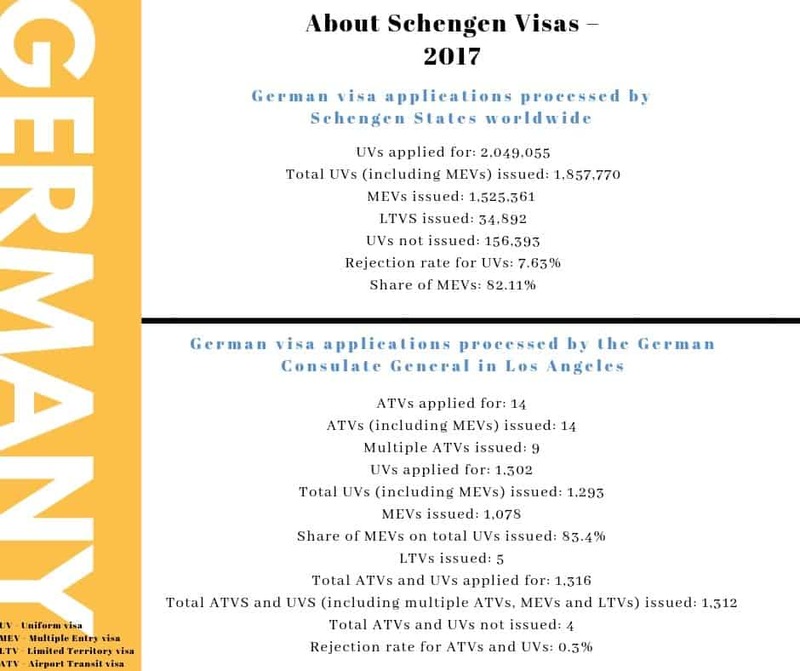 Of the 2,049,055 German Schengen visas issued worldwide in 2017, 7.63% were rejected. 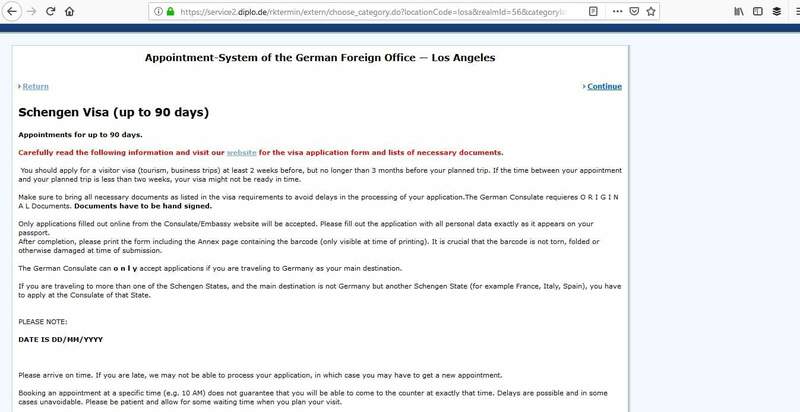 The consulate in Los Angeles issued 1,312 German visas out of 1,316 applications. If you happen to hold a B1/B2 type visa, you are only eligible to apply for an Airport Transit visa and this must be done in the country of your birth. 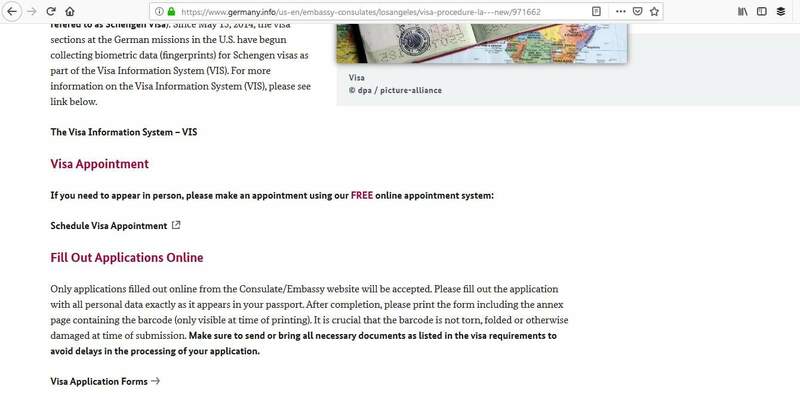 If you don’t apply for the correct one, this could delay your application, so please check the consulate’s website before you begin. 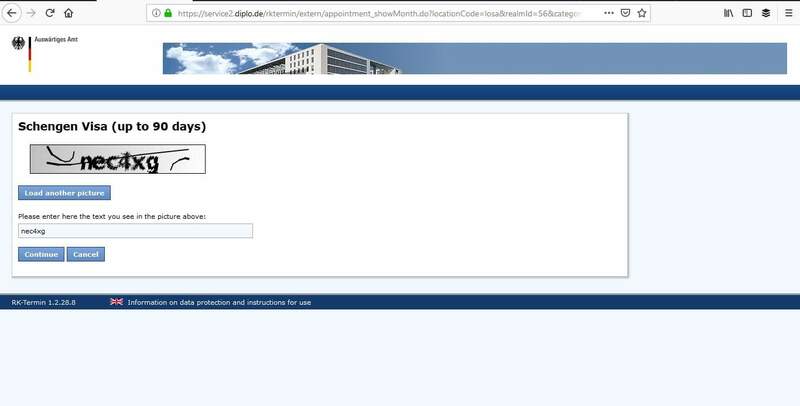 In order to apply for your German Schengen visa, there are 5 simple steps to follow. If you go through each step in order, you’ll find that this is the best way to make your application and receive your visa. When you apply you should take into account processing times and allow plenty of time for the consulate to review your application. Generally, processing times can be up to 15 days, but it could take longer depending on your nationality and type of visa you are applying for. Don’t fall into the trap of thinking that your visa will be accepted in as short a time as that. Apply well in advance to be on the safe side. 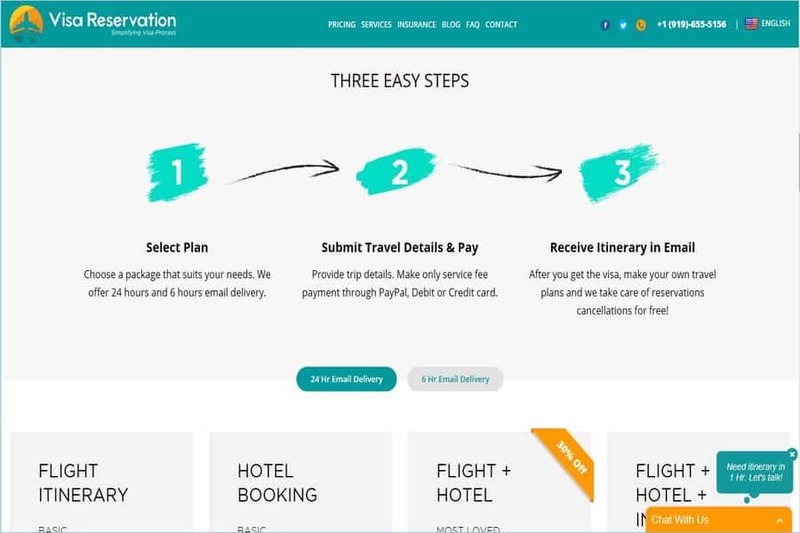 You can submit your application anything from 2 weeks to 12 weeks prior to your trip. 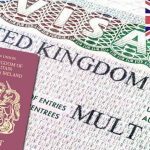 The first step is to complete your visa application form. 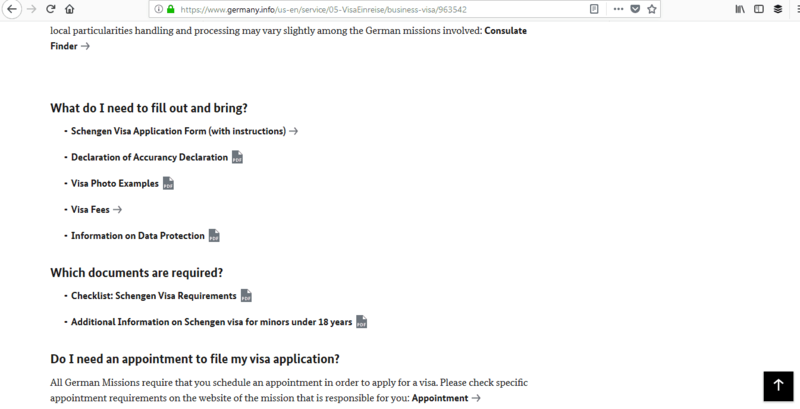 It’s very easy and it is done on the consulate’s website. 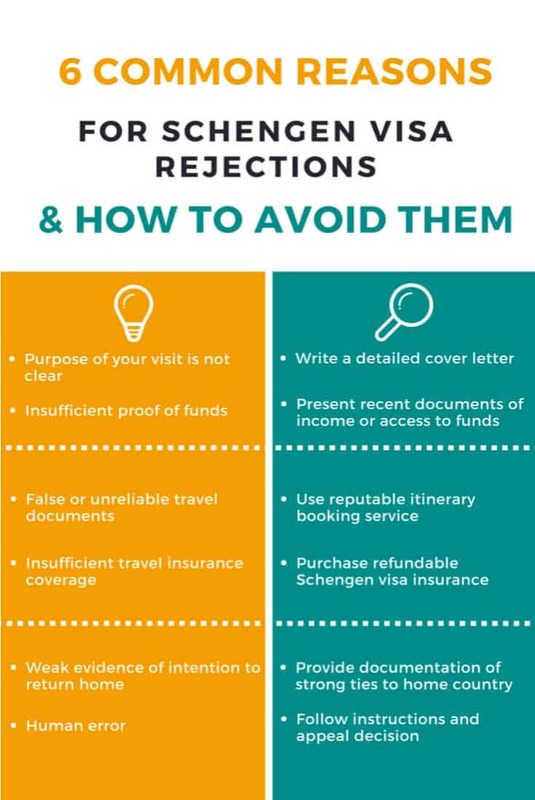 Choose either Schengen visa or Residence visa. 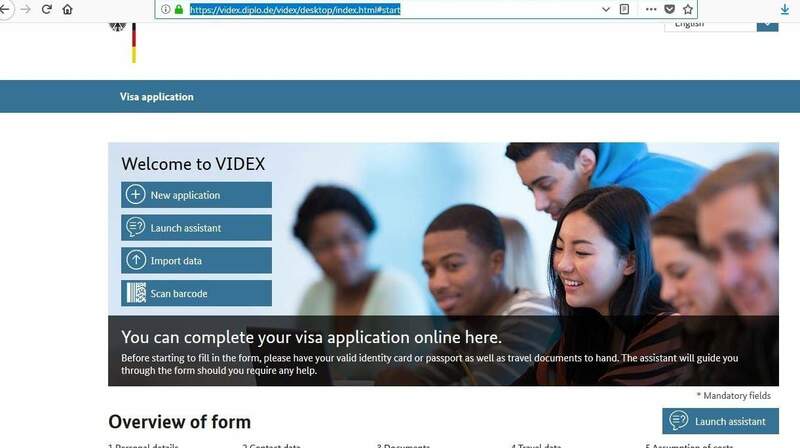 The online application will be completed using the consulate’s VIDEX software. It simple and easy to use and there are online instructions if you need help. However, this can only be used for applications up to 90 days. 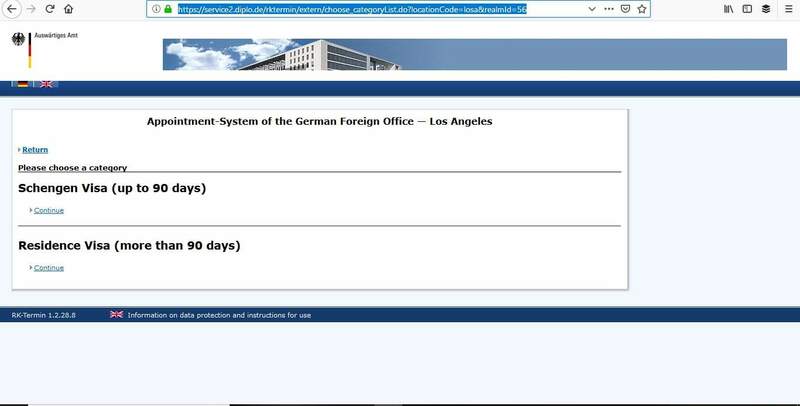 Applications over 90 days must submit a manual application form which can be downloaded from the consulate’s website. When you begin to input your data, you should have enough time to complete in one sitting because you could lose your data if you are not active on the system for more than 10 minutes. Make sure you have all your documents to hand to prevent this from happening. Once you have completed your application, remember to print the application and the Section 55 (2) (1) of the Residence Act forms, which you’ll need to sign, and the VIDEX barcodes. 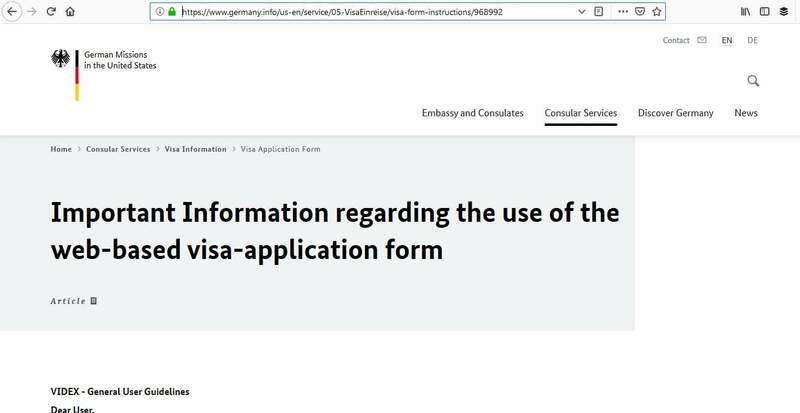 To make life even easier, you can send your application to the consulate by mail if you have applied for a Schengen visa within the last 2 years. If this applies to you, in addition to all the required documents, your passport, fee, postal slips plus an additional $25 fee, self-addressed envelope, and a document checklist must be sent to the consulate. The processing time for mailed applications is 5 weeks. Step 3 is extremely important to get right. 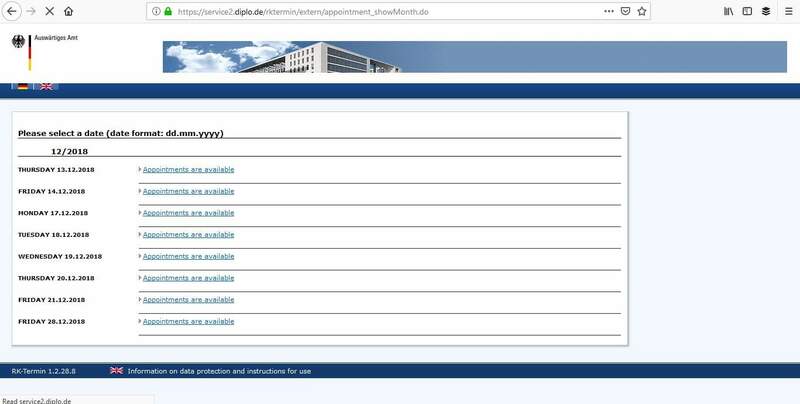 If you don’t have all the required documents your appointment will be cancelled and your visa application will be rejected. You must also provide originals as well as photocopies. On the day of your appointment, it is a good idea to bear the following things in mind. 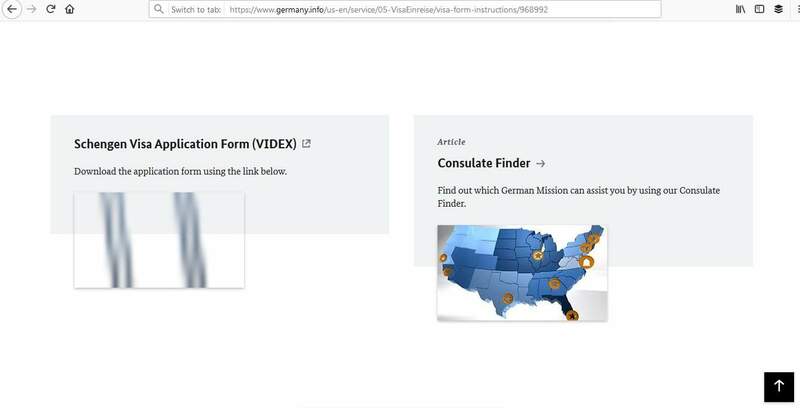 The idea is to make a good impression at your interview and make the visa official satisfied that you are a trustworthy person who has genuine reasons for traveling to Germany. 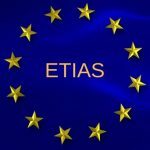 If you have never applied for a Schengen visa before, you’ll also need to provide biometric data which includes a photograph and a record of your fingerprints. At the interview, you’ll have to pay the relevant Schengen visa fee. Plus, an additional fee of $25 if you wish to have your passport mailed back to you. Have you ever traveled to other places? How do we know you will return home within the 90 days? Once your visa application has been reviewed and a decision made, they notify you when you can collect your passport. The other option is to have it mailed to you. To avoid any of these reasons, ensure your paperwork is up to date and you have provided all the required documents at your interview. Also, ensure you have provided evidence of sufficient funds and given satisfactory answers to questions asked. 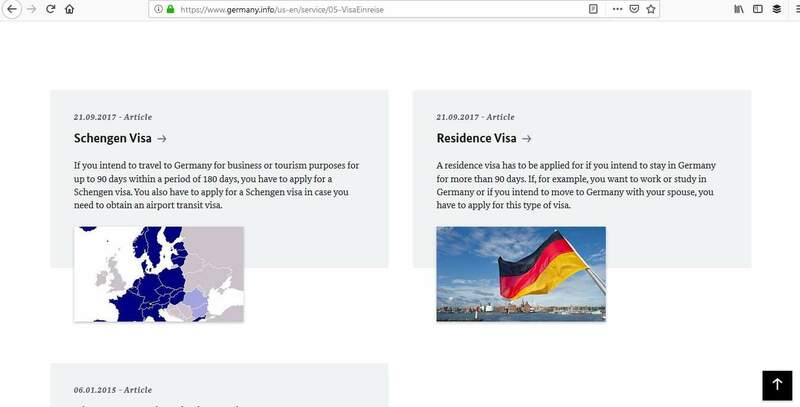 In summary, it’s easy to apply for your German Schengen visa. All you need to do is complete your application online, prepare your documents, attend your interview and submit your application. Hopefully, you’ll soon have your passport and new visa in your hand and you can get ready for your awesome adventure in Germany.